Leesa® provided a free mattress, pillows, and blanket for me to review. All opinions are my own. Hey everyone! As most of you know, my wife and I recently moved into the house that we built! One of the things that we found out very quickly when it comes to moving into your first home is that all of the furniture you had from your apartment doesn't quiiiite cut it haha. So after we moved in and got everything settled, we decided that one of the first things we wanted to do was replace the mattress that we had been sleeping on since college. We honestly should have replaced it YEARS ago, but our apartment's master bedroom couldn't really handle a king-sized bed, so we just kept sleeping on a way too worn out pillow top spring mattress. My back and neck have always had a lot of pain because I was in drumline throughout high school and college. The drums aren't super heavy, but it is pretty common for people in that activity to have some lower back and neck issues. I always felt like our old mattress (which was less than $800 and I'm sure we even overpaid for it at the time) didn't make that situation much better. So I went into the M$M private Facebook group and did a little survey to find out what type of mattress everyone was using, and what they recommended that I buy. I knew that a lot of people were doing the “mattress in a box” thing, but I honestly didn't know how popular they were. A lot of my readers in the group swore by them and recommended a few different brands to take a look at. I took those concerns and the recommendations from my readers and headed over to Google to do some research. After reading through tons of reviews and watching video review after video review, I decided to reach out to Leesa® and see if they would want to send a mattress over for me to check out for the site! They agreed and shipped over a king-sized mattress, two of their pillows, and the “Leesa® blanket” (which was exclusively for my wife because I don't really do blankets). This part of the process was just like buying anything else online. For the purposes of this review, Leesa® gave me a few different codes to use during the checkout process that made the mattress free. I've got to say – all of these direct to consumer mattress companies are on to something huge here. Personally, I hate dealing with salespeople (no offense if you're in sales). There's just so much weird pressure there, and obviously, the internet takes away all of that stuff. Also, it's just so much cheaper than what you think a high-quality mattress would cost. The Leesa® mattress ranges from $525 for a twin, to $1,120 for a king-sized mattress. I also received two pillows in this review, which cost $75 each, and the Leesa® blanket which costs $149. The only “disadvantage” that I could see with ordering a mattress online is that you can't lay on it before you buy, but Leesa® gives you 100 days to test the mattress out and send it back if you don't like it. Problem solved there IMO. Within a couple of days, all of the boxes showed up at our door. The mattress itself was a little heavy, so I'd recommend either dragging it without trying to lift it or getting a second person to help you get it to your bedroom. We've all seen the cool unboxing videos out there, and honestly, it's 100% as much fun as it looks haha. I'm not quite sure that I followed the directions as closely as they were shown on the mattress box…but it was still pretty easy. The surprising part was that I thought it would take several hours to expand to the normal size, but it seemed like it was only a few minutes before it looked like a legit mattress. Leesa® does tell you that it takes about a day for it to reach its full expansion size, but I honestly couldn't tell a difference after the first 5-10 minutes. We opened the mattress at night and went to sleep on it roughly an hour afterward. One of the big talking points that I saw on all of the mattress review sites was the Leesa® mattresses' cover and design. The cover fabric is supposed to look good, as well as allow air to flow through the top layer of the mattress and keep you cool while you sleep. I will say, the design looks really nice and the feel of the cover was great. But I'm not sure how important the look and fabric feel really is because we put a fitted sheet over our mattress (which I'm assuming most people do). If you are someone that doesn't use a fitted sheet (who are you? ), you could absolutely just leave the mattress bare and sleep on it. It actually does look that nice. How hot is the Leesa® mattress? This was the biggest concern for me. I've had MANY a night on my old mattress that I would wake up and be well…pretty sweaty. I was afraid that I would sink into this mattress and get the oven effect like I've heard so many times before about foam mattresses. Fortunately, the Leesa® mattress actually sleeps cool. You definitely don't sink into it (I'll talk more on that shortly), and the cover fabric must do its job pretty well. I read that this was the case in several reviews, which was actually why I decided to reach out to Leesa® in the first place. Houston has been about 70-80 degrees outside so far in November, so it's not like we are really experiencing winter weather here or anything. In fact, we haven't turned on the heater once since we moved into our house. I can't say if the mattress will sleep hot in the dead of summer, but based on what I've experienced so far I don't think I'll have much of a problem. Definitely a 10/10 in my book as far as the temperature goes. Is the Leesa® firm or soft? So as I mentioned above, you definitely won't sink into this mattress. I had never slept on a foam mattress before, but based on the first two weeks or so I won't ever be going back to a spring mattress. The mattress feels more like it “cradles” you and fills in around your lower back, between your shoulder blades, and around your neck. When it comes to how this combo feels from a soft/firm standpoint, I'll say that it's really neither. The best way that I can describe it is that it's soft enough to feel really comfortable but firm enough to where you aren't sinking into it. But if you forced me to choose one or the other, I'd say that it feels slightly (like 5%) more firm than it does soft. However, for my tastes, it does not need an extra foam pad that I noticed was fairly common among other direct to consumer mattress companies. It's definitely minimal and way less than a spring mattress, but still there. We didn't do anything crazy to test it out, other than me doing a couple of jumps onto the bed and asking my wife if she felt it. But my wife does get out of bed before me every morning, and it doesn't wake me up. For normal things like our cats jumping on the bed at night or just getting up to go to the bathroom, there really isn't much motion transfer at all. I wasn't super concerned about falling off the bed or anything like that, and so far I would say that the edge is fine on this mattress. They aren't as defined and sturdy as our old spring mattress, but with the king sized bed I don't come anywhere near the edge anyways. This really turned out to be a non-factor for me to be honest. All in all, I haven't slept on a lot of mattresses in my life so maybe I don't have the most mattress reviewing experience, and Leesa® absolutely did not ask me to say this…but this mattress is legitimately comfortable AF. So far I'm very happy with it. How are the Leesa® pillows? Comfy. They feel very similar to the mattress, but a little softer. They almost feel like a mix of down feathers and foam somehow, but they are made entirely from the Avena foam that's on the top layer of the mattress. The best thing to me is that they're soft but don't allow your head to sink all the way through to the bottom. So far, these have been really good for my neck pain. The pillows also have a nice look without a pillowcase. But again…who sleeps without a pillowcase? I still don't quite understand the point of the fancy covers haha. Last but not least, what is the Leesa® blanket like? The Leesa® blanket is made out of the same cover material that is on the mattress. It's pretty soft, but actually very heavy and feels more like a quilt than a blanket. I'm not a big fan of blankets or quilts because I sleep so hot, but my wife is constantly cold. I asked her what she thought of it, and she said that it's very warm but also very thick. She recommends it as more of a winter blanket than a summer blanket. At the time of writing, I'm not involved with a Leesa® affiliate program. But, if you use the code “M$M” at checkout you'll receive $100 off your mattress purchase! Have you ever ordered a mattress online? Thoughts? I’ve not ordered a mattress online but need to get some mattresses soon here. May have to check this out! My general rule of thumb is to spend for quality on things that separate you from the ground: shoes, tires/car, bike, chairs, and mattresses. That’s a good rule! I’ve been bad about that in the past, so I’m trying to get better at it haha. We are really happy with it. I was a little concerned about doing a review like this because it would have been weird if the mattress wasn’t comfortable. For me, the biggest thing was that it didn’t sleep hot and wasn’t too firm, and it checked off those boxes thankfully haha. Here are my thoughts as a 16 year veteran in retail sales, whose family owns the largest furniture store in our tristate area. First, and this is common. People who come in to buy new furniture for a new house, and like you, don’t want to spend a lot of money on a mattress because of all the money they’re spending on everything else. Don’t. Just don’t. If you find a mattress you love that is a great price, fine, but your mattress should have a bigger budget than the rest of your furniture. Your sofa, dining room suite, bedroom suite, etc., have no bearing on your quality of life. Trust me on this. Spend the money you have to on a good mattress. Secondly, buying furniture online. As a locally owned, family business that is celebrating 50 years years this year, online retailers are a huge reason that many places go out of business. People don’t understand that you get what you pay for. And what you’re getting online is usually inexpensive, but the quality doesn’t even compare to the price you’re paying. And when you buy online, your customer service is zilch. I cannot count how many customers who waste money on furniture they’ve bought online, they loved it, and a few years later they have to shell out more money to replace what they bought. The upside to this is that they generally do not buy online again, because there are certain things that are better bought in stores, that you can touch, feel, lay on, and have a local place you can call call when something goes wrong. Online retailers are becoming the demise of the family owned business, and it’s sad. I totally understand all of this – but I will say…these mattress companies are disrupting an industry with a good value proposition. The mattresses are comfortable, customer service is pretty extensive, and they have cut out a lot of the extra costs and hassle associated with brick and mortar retail. I wouldn’t buy furniture online because I agree – you need to see it first. But I would have no issue buying a mattress online, and there are several companies that seem to be putting out a product that people like. I’m ALL for family businesses, but industries evolve. I’d imagine that your family’s store will have to shift away from mattress sales in the next few years if it’s a big part of what they do (but that’s a total guess and I don’t know anything about their business). We were in a similar situation two years ago, when we finally replaced our worn out mattress with a Leesa. Other than committing to 7.5 hours minimum, it was the best sleep quality decision we’ve ever made. Thanks for the pillow and blanket reviews; we may consider those next. That’s awesome! Honestly, I wasn’t as aware of them as I was of some of the other ones like Purple or Tuft and Needle, but once I saw enough comparisons I thought it would be the best fit for what we needed. I’ve never ordered a mattress online, but I love that this industry is becoming so much bigger. I HATE shopping at mattress stores; it’s almost as bad as shopping at a used car lot. I haven’t shopped for one in a store since college, but I remember that it totally sucked haha. There are so many mattress companies out there that have thousands and thousands of great reviews! So far we are very happy with the mattress that we got. I have always wanted to try something like this. Thanks for the review! No problem! When you’re searching around, I’d really take a look at how hot they sleep and if they are soft or firm. We bought a mattress a few months ago. 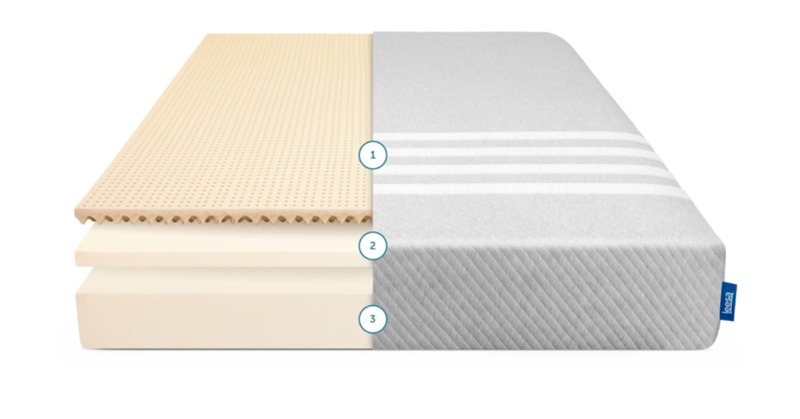 In all my research, honestly the Leesa was the only online one we considered ordering because 1) no latex (allergies run in the family) 2) foam density seemed good compared to others 3) Seemed like it might be firm enough…I hate foam-only mattresses. The feel of latex ones is nice, but see point #1. But we didn’t order because it was too “new” yet to get real life >1 year feedback yet, and most other mattresses seemed to have issues with body impressions/sinking after a year. So, we ended up buying from a local retailer a locally made mattress with great foam density (foam + springs) and bonus of they have flat pricing. No negotiating, you pay what the sign says, and it came out a bit less expensive than the online option AND they recycled our old mattress. That’s a great point – if there weren’t so many reviews I probably wouldn’t have gone for this. I think people are starting to really jump into this option though, so there’s more information to dig through. As long as you’re happy and the price was right, it sounds like you made a good choice! Does it have a chemical odour? I was worried about that too! It did have a faint odor right when we opened it (which Leesa tells you about beforehand), but it went away very quickly. I just went into the bedroom to smell the mattress and it doesn’t have a smell, so I don’t think it’s too much of a concern. Thanks for the review! It was super timely, as my wife and I have just started talking about needing a new mattress, and were looking into some of these online companies. We are trying to hold off a few more months, because we are most of the way through paying off 160k in student loans! I had no idea you were also in Houston. My wife and I live in the med center. I’m a member of an affinity group for young leaders in my company and was asked to speak about my success with budgeting and personal finance to a group of young leaders, and I spoke about your blog and Dave Ramsey in my presentation. It was definitely well received. There are so many young professionals who are looking to make better financial decisions and sometimes just don’t know where to start. Thank you for what you are doing! No problem! I’d hold off until your loans are gone unless you’re really concerned that you’re not sleeping well or experiencing a lot of neck/back pain. The $1,000(ish) would probably be worth it in that case. Great review. We bought a Tuft & Needle King bed last year and have been very happy with it. The price was GREAT, wonderful customer service, easy delivery and unboxing, low chemical load, and it’s comfortable. We’ve since bought a second for another bedroom. Did you get the foam topper? I’ve not bought a mattress online, but I learned about the importance of good bedding the hard way. I used to sleep on a really cheap pillow, and started getting morning neck pains. I ignored it until one morning it was so bad that I had to go to the urgent care clinic. Right after that, I went to a mattress and bedding store and bought a pillow that cost me about $200. My neck pains are gone, but the lesson is not. Buying a good pillow in the first place would have cost me much less than buying a bad pillow and paying for the doctor, not to mention the cost in pain. So I agree that good bedding is not something to be stingy on! Glad to hear that your neck pain is gone! I’ve been dealing with mine for 5-6 years, and having a decent pillow is finally helping. Can’t believe I let it go on that long. This is an AWESOME article! Thanks for the in-depth review! My wife and I are in the process of having our house built (we’re finally going to settlement in a few weeks). We’ve been looking for ways to save money on buying new furniture, so we’ve been looking at various mattresses online. Now, I’ve never purchased a mattress online, so I’m a bit hesitant on making such a purchase without testing it out beforehand. I’ve even gone as far as watching various reviews on YouTube and was quite entertained by the unboxing process. Your review has really helped to ease my discomfort. So I guess we’ll be moving forward with the purchase.